SAN JOSE, Calif., March 28, 2018 /PRNewswire/ -- Quantum Corp. (NYSE: QTM) today announced certification of Xcellis® Scale-out NAS with the Dalet Galaxy platform, delivering an optimized solution that meets the media asset management (MAM) and workflow demands of production environments. The combined solution provides a highly flexible and scalable approach to complex media production challenges, automatically and seamlessly moving data between storage media to match the most appropriate and cost-effective storage tier with the workflow stage. The certification extends Quantum and Dalet's successful 10-year partnership, which began with the integration of the StorNext® shared file system and data management with Dalet software and has enabled hundreds of media organizations to maximize the value of their assets through better creation, management and distribution of their content. Powered by StorNext, the Xcellis Scale-out NAS appliance unites robust media and metadata management with industry-leading performance and unmatched scalability to support content creators' most-demanding workflows and ease the transition to IP-based infrastructure. Xcellis systems boost productivity in collaborative media environments by integrating the most important components of workflow storage into a single, easy-to-manage hardware solution. An Xcellis cluster can scale performance and capacity together or independently to reach hundreds of petabytes in capacity and more than a terabyte per second in performance. When deployed as part of a multitier infrastructure — which can include object, tape and cloud storage — Xcellis Scale-out NAS can cost as little as 1/10 that of an enterprise NAS-only solution with the same capacity. Source material, work in progress, and finished packages can be shared and made instantly available on every desktop, or remotely. Users can produce more stories and packages in less time with a unique rights-managed workflow engine that enhances collaboration and productivity. "Quantum and Dalet have a long history of working closely to optimize and integrate joint solutions. Dalet solutions rely on high-performance, high-availability storage, and Quantum's Xcellis Scale-out NAS is the cornerstone of a quick, resilient approach to media production challenges." "Quantum's Xcellis Scale-out NAS combines the performance and scalability of a SAN with the cost-efficiency and ease of use of NAS. By affordably delivering high performance, petabyte-level scalability and advanced storage management capabilities, Xcellis Scale-out NAS is ideal for providing the storage backbone required by Dalet MAM users." 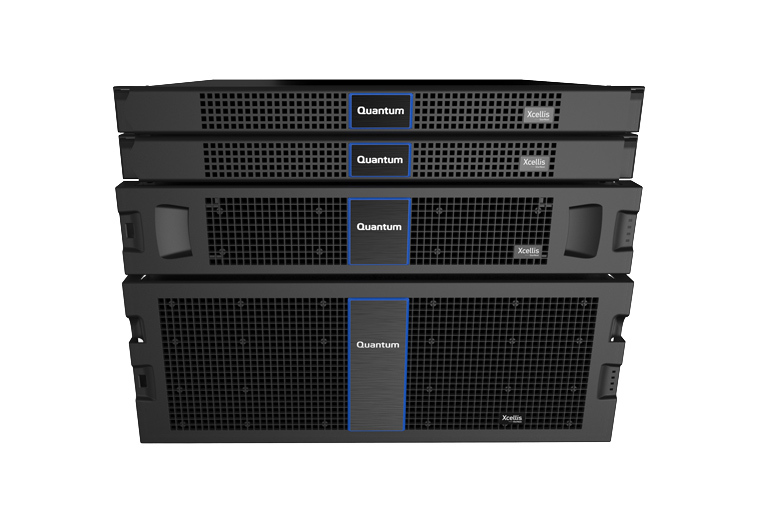 Quantum is a leading expert in scale-out tiered storage, archive and data protection. The company's StorNext platform powers modern high-performance workflows, enabling seamless, real-time collaboration and keeping content readily accessible for future use and remonetization. More than 100,000 customers have trusted Quantum to address their most demanding content workflow needs, including top studios, major broadcasters and cutting-edge content creators. With Quantum, customers have the end-to-end storage platform they need to manage assets from ingest through finishing and into delivery and long-term preservation. See how at www.quantum.com/customerstories-mediaent. Quantum, the Quantum logo, StorNext and Xcellis are registered trademarks of Quantum Corporation and its affiliates in the United States and/or other countries. All other trademarks are the property of their respective owners. "Safe Harbor" Statement: This press release contains "forward-looking" statements. All statements other than statements of historical fact are statements that could be deemed forward-looking statements. All forward-looking statements in this press release are based on information available to Quantum on the date hereof. These statements involve known and unknown risks, uncertainties and other factors that may cause Quantum's actual results to differ materially from those implied by the forward-looking statements. More detailed information about these risk factors are set forth in Quantum's filings with the Securities and Exchange Commission, including, but not limited to, those risks and uncertainties listed in the section entitled "Risk Factors," in Quantum's Annual Report on Form 10-K filed with the Securities and Exchange Commission on June 1, 2017 and in Quantum's Quarterly Report on Form 10-Q filed with the Securities and Exchange Commission on November 9, 2017. Quantum expressly disclaims any obligation to update or alter its forward-looking statements, whether as a result of new information, future events or otherwise, except as required by applicable law.